nicorn is pleased to announce the release of Diagnostic Assessments and Graphical Reporting within ComplianceServe. This new feature enables administrators to quickly highlight learners’ knowledge gaps and deliver tailored learning pathways to address those gaps – saving valuable time and maximising learner engagement. 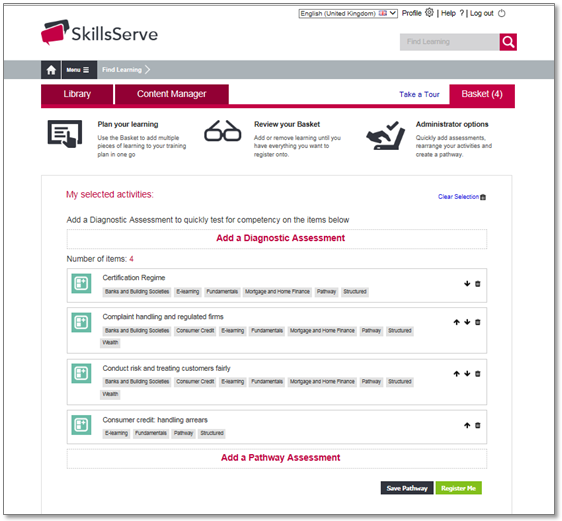 Diagnostics can be created for single courses or groups of courses using the “Add to Basket” feature in Find Learning, making this feature particularly useful for annual refresher training. All the questions in the ComplianceServe question bank have been mapped to related learning and based on their diagnostic result, each learner can be fully or partially exempted from the related learning. As an administrator you control the number of questions and the pass mark, and you can organise your diagnostics and associated content into pathways then assign them to your learners, individually or through the use of registration rules, in the usual way. We’ve also added a Diagnostic Dashboard – a new graphical report which shows performance and status details for pathways containing diagnostic and/or pathway assessments. Using Red, Amber, Green colour coding, the performance graph shows the number of learning activities where learners scored < 40%, between 40% and 70% and more than 70%. The status graph shows the number of activities which have been assessed, versus the number pending. For details on how to take advantage of this new feature, check out this article in the SkillsServe Knowledge Base, or contact the Unicorn Help Desk for further assistance.